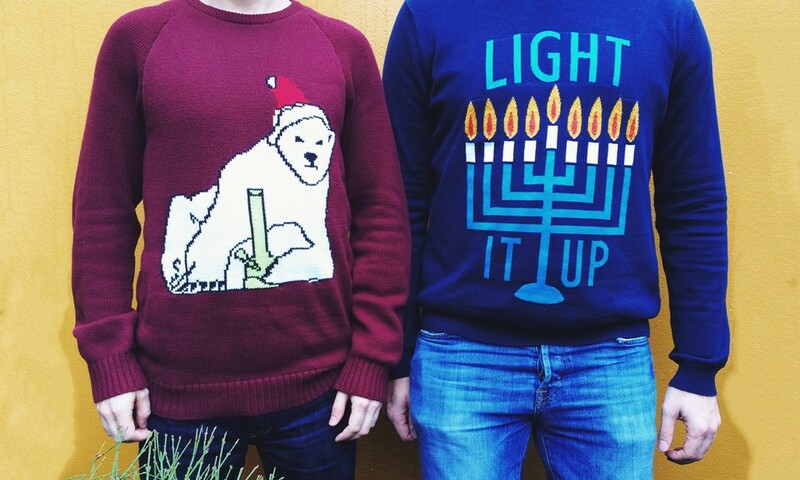 Hanukkah has ended but Christmas is rapidly approaching, which means there's still plenty of time to bust out your ugly holiday sweaters. This sartorial tradition first gained popularity in the early 2000s, when a trio of Canucks from Vancouver wrote "Ugly Christmas Sweater Party Book: The Definitive Guide to Getting Your Ugly On" to dispense advice on how to throw a spectacularly ugly Christmas sweater party for you and your friends. Since then, every December people gather together at office parties, happy hours, or festive home gatherings to proudly show off their tacky tops. If you're interested in going the cannabis-friendly route for your ugly holiday sweater this year, you're in luck. 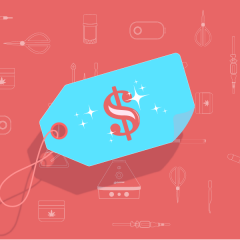 There are a number of gloriously ugly options to choose from, and we've compiled 10 of them to help you spread a little bit of holiday cheer while showing off your not-so subtle support of the cannabis movement. Volcom innocently labels this sweater as "Xmas 2," but there's no denying that the Santa Claus on the front of the sweater is sportin' a conspicuously-shaped beard. I suspect he's wearing sunglasses to hide his red-rimmed eyes, but maybe it's to shield the bright glow of Rudolph's nose. Another subtle sweater option is this curiously red-eyed gingerbread man with a stoned smile on his face and "Let's Get Baked" emblaze-oned across the front. Your guests may think you're just super into baking cookies until they glimpse the indistinct cannabis leaves covering each elbow. This option follows the holiday sweater tradition of repeating different festive icons, only the Christmas trees, Santa faces, and snowflakes are replaced with bongs, blunts, and cannabis leaves. As a fun bonus, you can pick up this sweater in various colors, including two that look suspiciously close to sativa red and indica purple. Fun! If you're going to be blunt with your affinity for cannabis, this sweater explicitly discloses that "The tree isn't the only thing getting lit this year." Pair this option with a Santa hat and pass out pre-rolls to your friends for some added holiday cheer. Everyone loves a good pun! (And by "loves," I mean "groans at," but exceptions must always be made when it comes to ugly holiday sweaters.) 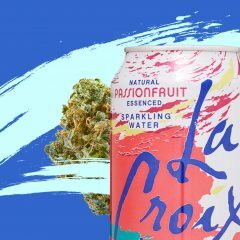 This festive option features a happy little cannabis leaf decorated as a Christmas tree above the text "Happy Holidaze" (and yes, that's a joint taking the place of the "i" in "holidaze"). Sometimes the simplest route is the ugliest one, as is the case with this sweater option. It's a plain black sweatshirt with a Christmas tree made entirely out of cannabis leaves. Bonus points if you add a little extra flair by gluing on some pom poms or tinsel to ugly it up even more! Yes, rapper 2 Chainz is getting in on the holiday spirit by offering his own line of ugly sweaters. You can opt for one of his "Dabbing Santa" sweaters while watching his "Watch Out" music video (featuring another "dabbing" Santa), or channel your inner Chainz by picking up this beauty, which comes with a pair of gold chains overlaying a pattern of cannabis leaves and other repeating designs. Pull it on and shout "We Own It!" Yes, they're cheap, and yes, they're probably not the best-quality sweater you'll purchase. 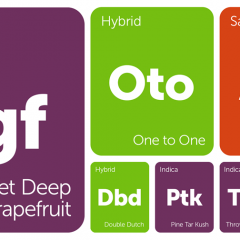 But these ugly options include a trio of canna-friendly designs. If you're a hybrid strain lover, you may want to opt for the patterned Santa and white cannabis leaf option. Fans of the vintage pin-up girl look should enjoy this light blue design with a cheesecake model posting in a teeny tiny Santa outfit and a bong. Or you can go all out with the design featuring Blitz-ened reindeer, a cannabis leaf Christmas tree, and "4:20" patterns along the front and bottom. Whatever your choice may be, it's bound to be appropriately ugly enough for your party. Do you have a cannabis-themed ugly Christmas sweater? Share a picture of you proudly wearing your festive attire on social media with the hashtag #LeaflyHolidaze and we may feature our favorites in a roundup!